I am getting ready to re-do a sunroom(south facing) to make it functional as a living space. It was renovated years ago, but has been used as an aviary for many years. The floor is concrete that had been painted, but the paint is in poor shape now. This room will be used lightly (mostly as a reading and relaxing in room) and I am needing advice on what kind of finish should be put down this time. Epoxy seems to be overkill, but plain paint doesn’t seem adequate. Suggestions? Hello Susan. Since the room is just seeing foot traffic, a 1-part epoxy paint would be a good choice. They are easy to apply and can be ordered in a variety of nice colors. This is an example here from Seal-Krete. Due to the U.V. exposure from being a sun room, a true 2-part epoxy will amber (yellow tint). Be sure to scrape up all the loose paint you can before you apply it. Can you explain what is 2 part epoxy? Hello VP. 2-part epoxy is explained in detail in the article. If you look back over the article you will find a full explanation. I have a flat roof over my garage. I installed salittio tile on the roof.. Will the 100 percent coat seal the tile so there is no leaking down below..?? No, it won’t John. It’s the wrong product for the job. Epoxy is an indoor concrete floor coating and does not do well exposed to the sun. A small section of my garage…about 4′ x 8 feet was enclosed and a floor covering was installed. The linoleum is deteoriatinf, hard to get clean. I would like to pull up the floor covering and replace with garage floor paint. What do I need to know about this application? The most important thing you must do is remove all the old glue from the concrete before painting. Once you pull the floor up it will most likely require grinding to remove the glue residue from the surface and the pores of the concrete. You can try a chemical stripper instead of grinding, but it may or may not remove the glue from the pores. It will require that you do a water drop test after the concrete has dried. If the concrete readily absorbs the water then it will be ready for paint. If the water beads at the surface without being absorbed, then that means the glue is blocking the pores and will require that you grind. The paint needs to penetrate the surface of the concrete in order to bond correctly. I do not understand what is the mixture of latex acrylic and epoxy coating. Hello Dennis. I’m not sure what you are asking really. We explain the differences in the article. Latex acrylic paint is basically the same water based product that you apply to the walls on the inside of your house. Epoxy is a 2-part thermosetting polymer that reacts when mixed together. If cures (does not dry like paint) to a very hard coating. I would like to paint the basement floor. It will be used for storage only. With the ceiling height only 5ft, so I have several pallets with casters mounted on it to make moving things around easier. It will not be a lot of traffic. 1 part epoxy paint will do the job? Or I better use 2-part epoxy paint? Hi William. If you are rolling around pallets on casters then a 2-part epoxy will be better suited for that. Just make sure you don’t have any issues with moisture in the slab or either type of product will delaminate. Have aa basement with a concrete floor that is not in good shape. If I use levelor to fill in and level the floor can I then put a 1-part epoxy on the floor? Yes you can, Mark. Make sure it’s an actual polymer-modified concrete repair material and not a self-leveling underlayment like you can buy at your local home improvement centers. Underlayments are not made for fixing such issues and they are not paintable. They are also not a wear surface. Their purpose is to lay wood flooring, tile, linoleum, or carpet on top. I have asbestos tikes in my basement, and I’m looking to see if a 2 part epoxy would work to cover over these and level out my basement floor. Do you see this causing any issues? This would be our rec room. No water issues in the basement. Hi Stacy. You have to be very careful with asbestos tiles. Epoxy can be used to coat over them, but it has to be a commercial product. Also, the surface needs to be roughed up with sandpaper before application of epoxy in order to achieve a mechanical bond. This creates asbestos dust which is dangerous. Additionally, epoxy should not be used to level floors. You would need an epoxy slurry for that and it can get very expensive. I’m about to build a commercial kitchen. Should I be looking for an epoxy coating or a high quality 2-part epoxy paint? Also, do you have any leads on how to achieve a cove around the perimeter of the room? Hello Ken. There is 2-part epoxy or latex acrylic paint. There is no such thing as a combination of the two. 2-part epoxy paint is still epoxy. It’s just a confusing way of marketing it to make people think it’s like paint, but it isn’t. You need a commercial quality 2-part epoxy or similar product for a commercial kitchen. Most of the vendors that sell commercial coating products also sell the thick formulations that are used to form a cove base as well. It generally requires a special trowel to help form it. We suggest contacting someone like ArmorPoxy to discuss your options. You will not find what you need from a home improvement center. I have a small townhouse with a small 20×10 patio in the backyard that gets 50% of the sun (In Arizona). Previously there was an old grey paint that I had to remove via a concrete grinder and acid wash. I wanted to rejuvenate this area and was thinking about putting an epoxy down from Sherwin Williams but then read your comment about Epoxy not being UV-Proof. What recommendation do you have for me? Thanks. I would like to paint/epoxy the area to make it look nicer again. Hello Mike. Yes, epoxy is not a good medium for outdoor use. Unlike paint, floor coatings that are used outdoors can be very slippery when wet as well. An anti-slip additive is important to use. Though more expensive, a proper coating can last years and years outdoors where as paint will most likely last a couple years or so before it needs to be touched up or redone. Polyurea, polyaspartic, and polyurethane coatings are the ones that are typically used outdoors. They are generally a slightly different formula than those used on garage floors and they have anti-slip options as well. We recommend contacting either Legacy Industrial or ArmorPoxy and ask them about their outdoor coatings for your project. If you decide on paint instead, a 1-part epoxy would be the best bet. Since they are mainly latex paint, they are U.V. resistant as well. Seal-Krete offers the best color palette by far. We have latex paint over our concrete garage floor. We would like to put rustoleum epoxy coating over it. Can we do this, if so what prep do you recommend. Technically you can, Rich, as long as you are using the standard water based epoxy and not their Professional series which is solvent based. It requires that you rough up the surface of the paint with 120 grit sandpaper in order for the epoxy to achieve a mechanical bond to the paint. However, we don’t recommend it. The reason is that the bond of your overall coating is only as good as what is adhered to the concrete. In other words, the superior bonding characteristics of epoxy to concrete will be lost since it will be bonding to the latex paint instead. Latex paint tends to peel from concrete, so the entire coating will peel if the latex paint does. In order to ensure the best performance, we recommend grinding the concrete to remove the paint first. This will also prep the concrete for a coating at the same time. I have put a two part epoxy on my basement floor and loved the results it gave me in helping fill and level (small) divot in my floor. We decided to paint the walls with an epoxy paint. To make it a little less expensive I purchased a one part epoxy paint (before doing my research; dumb idea) I painted one wall and it is not filling in the pores of the concrete like my floor. My question is do you think it will fill with a second coat or should I go spend the money on the two part epoxy coating? Hi Shannon. Epoxy floor coatings are not designed for wall paint. They will begin to slump and run if you try to apply them very thickly since gravity is working in the wrong direction, unlike a floor. Our suggestion is to use filler on your walls first and then paint them just as you would normally do. Hello Peter. No, epoxy will not work because it is not U.V. resistant. It will turn a chalky white color and deteriorate in the sun. Also, most coating will not adhere properly to asphalt since it is oil based. I have an older car I want to keep going for another year. Works great, but the Oil Pan is getting badly worn. I hope to wash it well and remove all oil with solvents, then 100% epoxy paint it. This would give it wear protection for a year, I hope. I understand cured epoxy is resistant to gas and oils. Also there should not be any UV. Some hot (not extreme) temperatures and snow / sand / water / etc abrasion. A 200$ oil pan would not be a good investment here, and I like puttering in my retirement. Ready, aim, shoot me down! Hello Dan. If you are talking about an oil pan for a car, then no, it’s not going to work. Epoxy starts to soften between 150-160 degrees. Oil can get well over 200 degrees. Hi! Thanks for all of the great articles! Before reading all of your wonderful articles I purchased Seal-Krete brand Epoxy-Seal concrete and garage floor paint and began to paint and spread color flakes. I finished half of my two car garage before I realized it wasn’t providing the shine or overall smoothness I remember seeing in my mother’s garage (she claims to have used this same product). It also wouldn’t fill in the tiny cracks in the concrete as I expected it would. 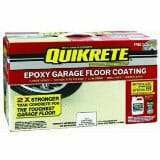 My question is what can I use to put a glossy finish in the garage floor paint with color flakes in it? Also, what can I use to fill in those tiny cracks without breaking the bank or ruining the work I’ve already done? I’m on a relatively tight budget. And I typically do all of my own vehicle repairs/maintenance, and do the same on friends’ vehicles, so I tend to get the occasional oil drips, or brake fluid drops, or etc etc. Thank you so much for reading, and thank you even more if you respond with some advice. Hi Tyler. Unfortunately the problem is with the product you are using. You will not get the shine, durability, or thickness from paint like a high solids epoxy or similar coating will provide. Paint shrinks quite a bit when it dries and is why it will not cover small spider surface cracks. You can’t really put shine into it as well. Clear coats help, but paint is not designed for clear coats. You can use Rust-Oleum concrete crack repair on the cracks. It is not very expensive providing that you don’t have too many cracks. Also, keep in mind that brake fluid will soften the paint fairly quickly if it’s not wiped up. Even then it may stain. Our suggestion is to continue painting the rest of the floor without spending any more money. Save up and then when the budget allows for it, grind the paint off and apply a proper epoxy coating system for the type of work you like to do in your garage. I would like to use an epoxy paint to refurbish my concrete / marble sheen pool. What do you recommend? Pool size is approx 90sq metres. Hi Liz. Epoxy garage floor coatings are not made for such use. They are an indoor coating only. Also, U.V. rays from the sun will cause the epoxy to oxidize over the years. You would need a special polyurea spray on coating for pools if you want to use a similar technology. They are usually applied by professionals. I have removed old vinyl tiles from basement floor. There now are some holes, cracks visible as well as old adhesive. How can I prepare this floor to finish with epoxy. Hi Anita. All the old adhesive needs to be removed and the holes and cracks repaired. Grinding the concrete is the quickest and easiest way to remove the old glue. It will also prep the surface for epoxy at the same time. If you elect not to grind, then you will need to remove the glue via chemical means. There are ECO friendly products available that work well, they just take longer to work and it gets messy. After the glue is removed via chemical means you can then etch the concrete to prep it for epoxy. Can I apply epoxy coating to tiled toilet floor which is heavily used daily say in the public toilet. No, you can’t apply epoxy to a tiled floor Thynmoon. The surface is too smooth and the coating will peel right up. Thank you for all of the effort you put into your articles and answering questions. Very professional. Hello Dana. White coatings take a little more work, but they can look nice if done correctly. It generally requires a base build coat of white epoxy followed by one or two coats of white polyurethane. The white base epoxy is needed since any other color underneath would affect the look of the white polyurethane. The polyurethane is U.V. resistant and will not amber. We suggest contacting an experienced vendor for such a project. The word is led, not lead. That is correct! Thanks for pointing that out, Harry. I have a finished basement and I want to paint the concrete floor. What kind of paint should I use? Hello Anne. If you want to paint the basement floor and not apply a coating, we would recommend a good 1-part epoxy paint. We have an article about them here. I am considering covering my garage floor which is 12 years of age with a covering. Do you think that the 1 part epoxy will do the trick. I am 69 years old just keep that in mind. my basic question with proper prep work will the 1 part coating last say 10 to 20 years with car usage and one pickup truck ? Hello Gene. No, 1-part epoxy paint will only last a few years. 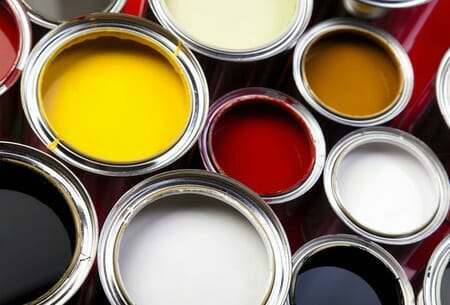 It is essentially a fortified paint and is not a high performance coating. A common complaint is hot tire pickup within the first few months of applying it – sometimes sooner. It generally needs to be reapplied after a few years or so in order for it keep looking nice. You cannot apply a clear coat to 1-part epoxy paint either. If you want something that will last 10+ years and is fairly easy to apply, we highly recommend one of the newer single-part polyurea coatings. Thank you for your wonderful article. I have concrete floors inside of my house. I want to use the marbalized method with the epoxy. When they say metallic epoxy floors are they referring to the metallic pigment ? Can I use this on my floor?. Yes you can, Danye’ll. RockSolid has a DIY version which we discuss in this article here. You can also apply a tougher and more exotic type of metallic coating with the type of kits we discuss here. We are considering buying an older home that appears to have an “epoxy treated/painted” floor in the garage. It is an estate sale so no one appears to know what the prior treatment was. Also, the present color of the floor is a maroon! Since so little is known regarding this issue, would we need to do a complete grind to remove the prior coating/painted floor of the garage or what would you recommend? Thanks in advance for your advice! Hello Jan. Yes, maroon is not common and an indicator that it may be paint and not a true coating. If it’s paint, it is highly recommend to remove it via grinding if you want to apply a true coating. If it is epoxy (or something similar) and it is adhered well, then you can get by with just roughing up the surface with 120 grit sandpaper first. You can generally test for a coating by applying a liberal amount of acetone on on the floor and then rubbing it hard with a rag. If the colored surface gets soft or bleeds out onto the rag, then you have paint. If it just loses gloss and stays hard, then it’s a true coating.